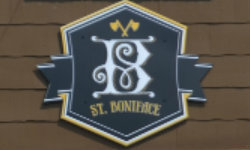 St. Boniface Craft Brewing Company is a small brewery that started out as a cool hobby in the owner’s garage, and steadily grew to occupy the hip, loft-like location they have today. Open Tuesday – Wednesday, 4:00 pm – 8:00 pm, Thursday – Saturday, 11:00 am – 8:00 pm, St. Boniface is a great place to meet friends for happy hour, or to grab dinner, and literally, drink the best pint of beer in town. In 2013, St. Boniface finally got a license to sell beer by the pint (prior to that the could only offer samples). In addition, you can buy and fill growlers there. Libation, a double IPA and Hegemony, a Stout, are two long time favorites and mainstays at St. Boniface. They also have a Wheat Beer, a Pale Ale, and a growing list of ‘regular offerings’ on tap, plus additional seasonal beers that they brew at various times of year. We’ve yet to be disappointed by one of their creations! OH, and if you’re not a beer fan that’s OK too, the owners have established relationships with a few local wineries, so you can choose from a selection of wines instead if you prefer. The atmosphere at St. Boniface is laid back and friendly. It feels like an American version of a “local pub” in England… where friends gather at the end of the day for no other reason than to hang out, talk, listen to good music and drink good beer among friends. From the Author: Dave and I are both craft beer fans. I spent three years living in England and Belgium, where I acquired a taste for good beers with bold flavors. Early on in our relationship, we even dabbled with home brewing ourselves, whipping a fair facsimile of Sierra Nevada Pale Ale...but in the end we never really had the time or space to devote to home brewing, and began seeking out small craft brewers who were creating the types of beers we like instead. You can only imagine our excitement when St. Boniface moved out of the owner's garage and into their first location!!! Suffice it to say, we're pleased by St. Boniface's success, because it guarantees that we can keep on buying the types of beer we love, VERY close to home!! Every Day it's Like a New Restaurant! Check the St. Boniface facebook page to see what food truck they've lined up on the day you're going. It rotates daily, so every day is something new, but they're ALL good! But just in case, there's a pizza shop a couple doors down (Little Nicky's), who will deliver if you want something different than the food truck has to offer.